The long-anticipated return of Matt Wilson’s Arts and Crafts gets the week off to a flying start. The band is up in Duluth for the Head of the Lakes Jazz Festival at UMD on Friday night, coming down to the Artists Quarter for one glorious night on Saturday (3/5). I first heard Matt and this quartet about four years ago at the Dakota, then again at the club in early 2007. Bassist Dennis Irwin passed away before I saw them again, this time at the 2008 Detroit Jazz Festival with young German bassist Martin Wind ably taking over. Gary Versace is usually on organ/piano but for this tour, James Weidman takes over the keys while Versace tours with Madeleine Peyroux. I’ve never heard Weidman live but he is a major force on Joe Lovano’s Folk Art recording with the Us Five ensemble. And on trumpet we’ll hear Terell Stafford, a favorite at the Dakota (he recorded live a few years back). 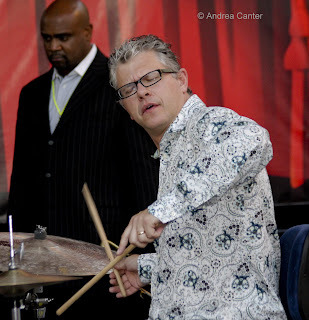 But the centerpiece is drums and Matt Wilson, one of the most animated, maniacal, musical drummers in modern jazz. He’s also one of the busiest, keeping up not only with Arts and Crafts but with his “out” quartet, his Carl Sandburg Project, numerous live and recording gigs with a raft of vocalists, and some new projects involving solo, trio and larger groups. The AQ is scheduling two ticketed sets. Monday and Tuesday, the Dakota hosts a perennial favorite in a new context. Hiromi, the young pianist who stole the show at the 2004 Twin Cities Jazz Festival and has since captured global attention with her trio, Sonicbloom quartet, duets with Chick Corea and collaboration with the Stanley Clarke Trio, went into the studio alone and came out with one of the most stunning efforts of her career. She’s touring in support of Place to Be, and believe me, the Dakota will be the place to be early in the week. 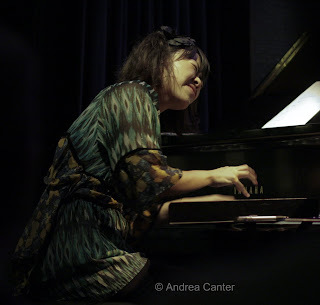 And Chicago is the place to be this weekend—I’ll catch Hiromi at the Jazz Showcase Friday night. An interesting look at how young jazz musicians evolve will be on the menu at Honey, below the new Ginger Hop in northeast Minneapolis on Wednesday night (3/10). The high school ensemble, Dakota Combo, stretches as they support vocal students from MacPhail before taking off on their own set. Director Adam Linz says this will be a learning-by-doing activity—getting the charts and making music, an essential skill for aspiring jazz artists who want paid work. 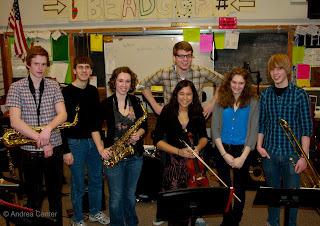 Hear some up-and-coming voices as well as seven outstanding young instrumentalists. With the upcoming King for Two Days weekend at the Walker (March 12-13), you can get a preview and some insights from Dave King himself, speaking at a free presentation at the Walker on Thursday (3/11) at 8 pm. Plan ahead for the weekend extravaganza as King brings nearly all of his bands to the McGuire Theater—Buffalo Collision, Bad Plus, Happy Apple, and the combined Bad Apple all on Friday night, and new bands Golden Valley Is Now (with fellow Golden Valley natives Craig Taborn and Reid Anderson) and Dave King Trucking Company (with Erik Fratzke, Chris Speed and Adam Linz). There’s rumors of a surprise set….